For the album by Chemistry, see Second to None (Chemistry album). 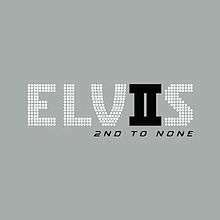 2nd to None is a collection of songs by American rock and roll icon Elvis Presley. The album was released by on October 7, 2003 by RCA Records (see 2003 in music) as the sequel to the previous year's highly successful ELV1S: 30 #1 Hits. The album included Elvis's #1 singles that did not appear on the previous release, other notable recordings by the artist, one previously unreleased recording ("I'm a Roustabout") and a remix of "Rubberneckin'" by Paul Oakenfold. 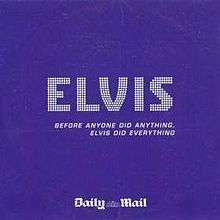 To promote the album in the United Kingdom, a compilation album titled Before Anyone Did Anything, Elvis Did Everything was released as a free covermount album in the British newspaper Daily Mail. The album contains a blue cover quite similar to that of 2nd to None and ELV1S and ten songs, although not all of these are from 2nd to None, as some are from 30 #1 Hits and various other releases like the Close Up box set. 1 2 Erlewine, Stephen Thomas. "2nd to None by Elvis Presley". Allmusic. United States: Rovi Corporation. Retrieved August 4, 2011. 1 2 3 ELVIIS: 2nd to None (CD liner). Elvis Presley. RCA Records. 2003. 82876 51108 2. ↑ Erlewine, Stephen Thomas. "Review: 2nd to None by Elvis Presley". Allmusic. United States: Rovi Corporation. Retrieved August 20, 2012. ↑ ELVIS: 2nd to None (CD liner). Elvis Presley. RCA/BMG. 2003. 82876 55241 2. ↑ ELV1S: 30 #1 Hits (CD liner). Elvis Presley. New York City, New York, United States: RCA Records. 2002. 07863 68138-2. ↑ "Elvis Presley – ElvIIs 2nd to None (Album)" (ASP). Australian Charts. Hung Medien. Retrieved July 21, 2011. ↑ "Elvis Presley – ElvIIs 2nd to None (Album)" (ASP). Austrian Charts (in German). Hung Medien. Retrieved July 21, 2011. ↑ "Elvis Presley – ElvIIs 2nd to None (Album)" (ASP). Ultratop (in Dutch). Hung Medien. Retrieved July 21, 2011. ↑ "Elvis Presley – ElvIIs 2nd to None (Album)" (ASP). Ultratop (in French). Hung Medien. Retrieved July 21, 2011. 1 2 "2nd to None – Elvis Presley". Billboard. Prometheus Global Media. Archived from the original on 21 July 2011. Retrieved July 21, 2011. ↑ "Elvis Presley – ElvIIs 2nd to None (Album)" (ASP). Danish Charts. Hung Medien. Retrieved July 21, 2011. ↑ "Elvis Presley – ElvIIs 2nd to None (Album)" (ASP). Finnish Charts. Hung Medien. Retrieved July 21, 2011. ↑ "Les "Charts Runs" de chaque Album Classé" (PHP). InfoDisc (in French). Find "Elvis PRESLEY" under the drop-down menu to see statistics. ↑ "Chartverfolgung / PRESLEY, ELVIS / Longplay". Music Line (in German). Media Control Charts. Retrieved July 21, 2011. ↑ "Top 75 Artist Album, Week Ending 9 October 2003" (JSP). GfK Chart-Track. Retrieved July 21, 2011. ↑ "Elvis Presley – ElvIIs 2nd to None (Album)" (ASP). Dutch Charts (in Dutch). Hung Medien. Retrieved July 21, 2011. ↑ "Elvis Presley – ElvIIs 2nd to None (Album)" (ASP). New Zealand Charts. Hung Medien. Retrieved July 21, 2011. ↑ "Elvis Presley – ElvIIs 2nd to None (Album)" (ASP). Norwegian Charts. Hung Medien. Retrieved July 21, 2011. ↑ "Oficjalna Lista Sprzedaźy: October 27, 2003" (ASP). OLiS (in Polish). Retrieved July 15, 2011. ↑ "Elvis Presley – ElvIIs 2nd to None (Album)" (ASP). Swedish Charts. Hung Medien. Retrieved July 21, 2011. ↑ "Elvis Presley – ElvIIs 2nd to None (Album)" (ASP). Swiss Charts. Hung Medien. Retrieved July 21, 2011. ↑ "Chart Archive: Top 40 Official UK Albums Archive – 18th October 2003". The Official Charts Company. Retrieved July 21, 2011. ↑ "ARIA Charts – Accreditations – 2003 Albums". Australian Recording Industry Association. 1 2 "Tilastot: Hakutulokset" [Statistics: Search Results]. Musiikkituottajat – IFPI Finland (in Finnish). Retrieved August 4, 2011. ↑ "New Zealand album certifications – Elvis Presley – 2nd to None". Recorded Music NZ. ↑ "The Official Swiss Charts and Music Community: Awards (Elvis Presley; '2nd to None')". IFPI Switzerland. Hung Medien. ↑ Before Anyone Did Anything, Elvis Did Everything (CD case). Elvis Presley. BMG. 2003. ELVIS 01.